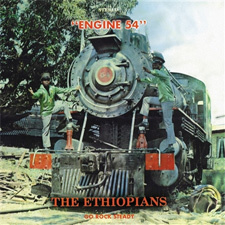 Following the tragic death of Leonard Dillon recently, Trojan have moved swiftly to reissue the Ethiopians debut album from 1968; Engine 54, on CD. This album has seen various reissues over the years, often with extra tracks tacked on, this release goes back to basics and features just the ten tracks as originally issued. The result is a little brief by CD standards but as it’s retailing for around £5 this is forgiveable. As they’ve gone the faithful reproduction route it’s a pity there is no vinyl issue but whilst Trojan are currently strong on 7″ vinyl they don’t seem to be pressing up LP’s. The CD’s ten tracks are rocksteady with a couple of ballads mixed in. The massive hit Train To Skaville obviously dominates but the title track is also a revival classic and other superb tunes such as Train To Glory and Come On Now make this well worthwhile.